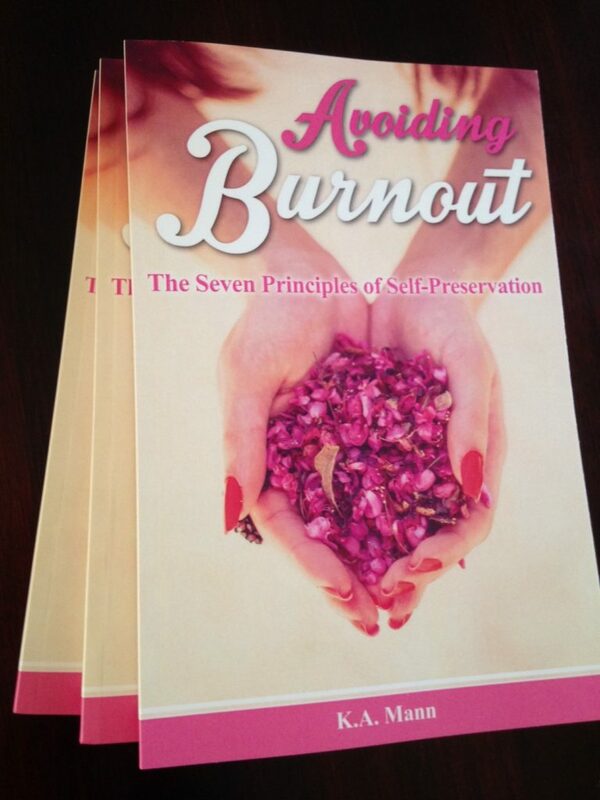 Unfortunately, I had no choice but to bring my daughters along as my wife was shooting a promotional video at home ahead of her book launch and didn’t want an audience – shameless plug, it is a fantastic book, “Avoiding Burnout: The Seven Principles of Self-Preservation” and you can buy it here. My wife was recording a promotional video ahead of her book launch which meant I had to drag two kids to the registration. I hoped the registration process would not lead to further frustrations and was pleasantly surprised – less than 5 minutes to get my race number and goody bag. My daughters meet the race mascot “Soweezy”. 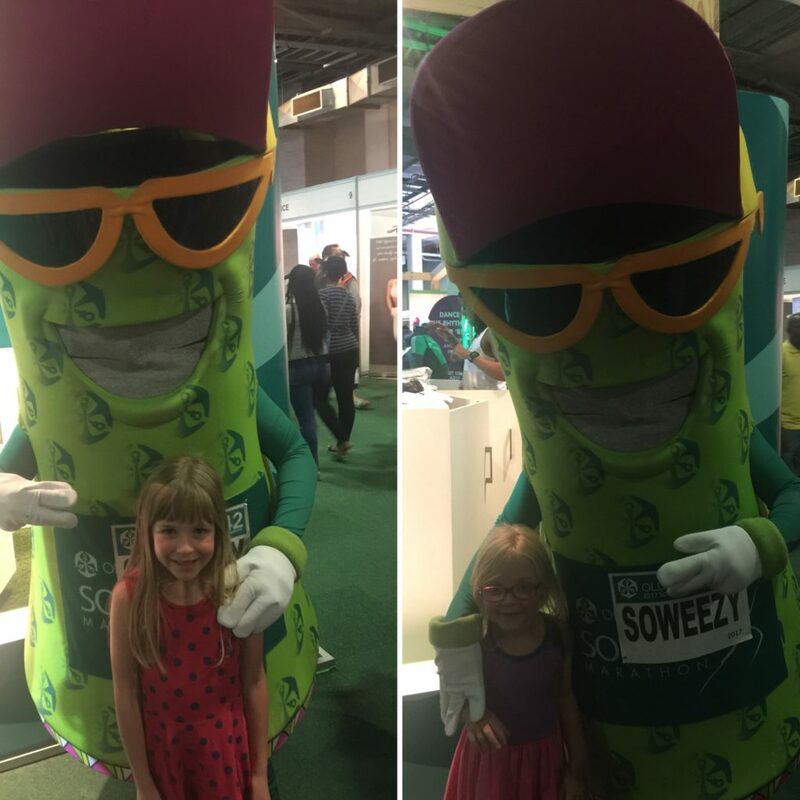 My daughters enjoyed meeting the race mascot Soweezy – although this name is either a blatant lie (Soweto Marathon is definitely not “So easy”) or because he smokes 2 packs a day (“So wheezy” in case that’s too cryptic). My kids perked up when they realised that they could score some “free stuff” – their haul included a loaf of bread (thanks Albany), a frisbee and lip balm (thanks Sun City Holiday Club) and as much Powerade as they could drink (“blue” was their favourite flavour). Attitudes and energy levels perked up after that (but it might just have been the Powerade kicking in). Route Profile – definitely not “So Eezy”! The race is hot, hilly and a mile above sea-level (and there is a stack of climbing in the second half). Having procrastinated as long as I could, it was time to return to the car for some upper body / lower back cross-training and replace the flat tyre. 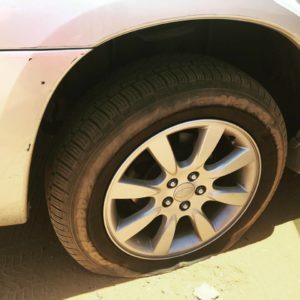 Whilst sweating in the dust under the hot sun, I contemplated that a flat tyre was symbolic of how I’d feel in 24-hours’ time reentering Soccer City on foot after enduring 42km of the best that Soweto could throw at me. In looking for a silver lining, I realised that I’ve been quite lucky with flat tyres – the last one I got was 11 years ago on honeymoon (and no, that’s not a euphemism!). A running friend pointed out that “one often starts Soweto Marathon all pumped-up but might get deflated in the heat.” On reflection, one normally finishes a marathon on a runners’ high – if you don’t it’s probably because you got deflated by releasing too much gas on route! A flat tyre on the way to marathon registration. Symbolic of how I’d feel in 24-hours’ time or a bad omen? Tyre successfully replaced, it was off to the library and then an extensive grocery shop with the kids – by the time I got home mid-afternoon I’m sure I had burned the equivalent number of calories that would be consumed during the next day’s marathon! The only consolation was that tomorrow morning it would just myself to look after and not two very energetic little girls (in hindsight, unlimited Powerade was probably not the best idea). 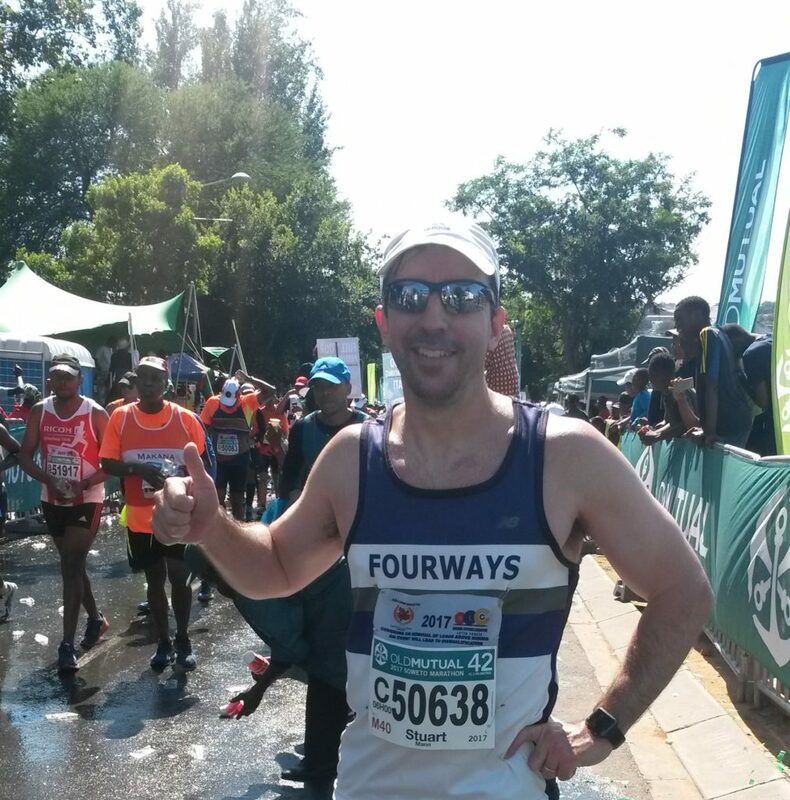 On race morning I joined 17,000 other runners taking part in the various distances (10km, half and full marathons). The marathon was capped at 11,000 entries which was reached shortly before the entry cut-off date. There was obviously quite a high drop-off rate as just over 7,500 runners eventually made it to the very festive 6am start. The iconic Calabash aka Soccer City aka FNB Stadium aka host stadium to the 2010 Soccer World Cup final served as a suitable backdrop to get us underway. 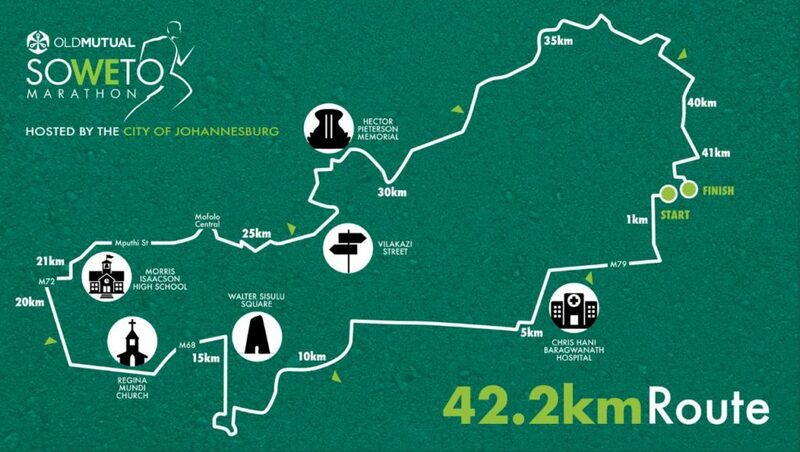 Soweto Marathon starts and finishes in the iconic Calabash Stadium where the 2010 World Cup Soccer final was played. The route is an excellent way to tour Soweto on foot and includes many historical landmarks. It took about 5 minutes to cross the start line from C-batch (roughly middle of the field) and when I finally started running it was not long before I had worked up a good Soweto sweat. The race is normally scorching hot with very little in the way of shade and this year did not disappoint – the predicted high in the early 30s was achieved by mid-morning. 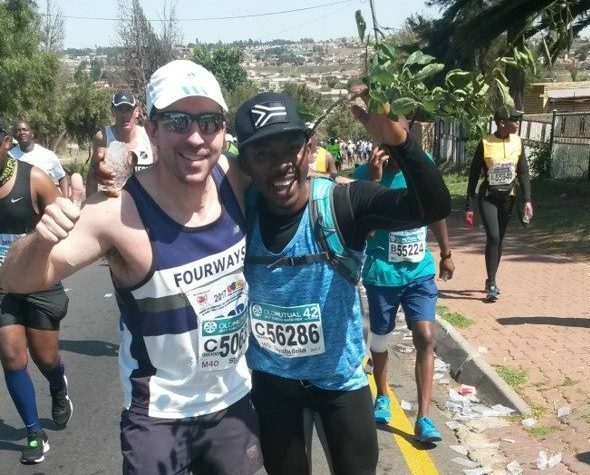 Soweto has a buzz that is difficult to describe, very different from other big marathons and is perhaps the best way an average middle-class white guy from the suburbs can get to experience ubuntu. It’s also one of the few Gauteng races that attracts runners from other parts of the country – but sadly recreational international runners are something of a rarity. The elite athletes were competing for a first place prize purse of R220k (slightly less than the R265k on offer at Cape Town Marathon). This year the men’s race was won by Tsepo Mathibele of Lesotho in just under 2:20. There has not been a South African women’s winner since 2009 but this year Irvette van Zyl (2:41) narrowly beat out Soweto local lady Mapa Makhanya for a SA 1-2. A nice race report of how it all went down is here. Things are looking good for South African womens’ running with the recent formation of Team Massmart whose mission is to “promote women athletes with the aim of glory in the biggest world marathons.” As far as I know, Colleen de Reuck is the only SA lady to finish on the podium of a marathon major (she won Berlin in 1996) – so this is a worthy objective. 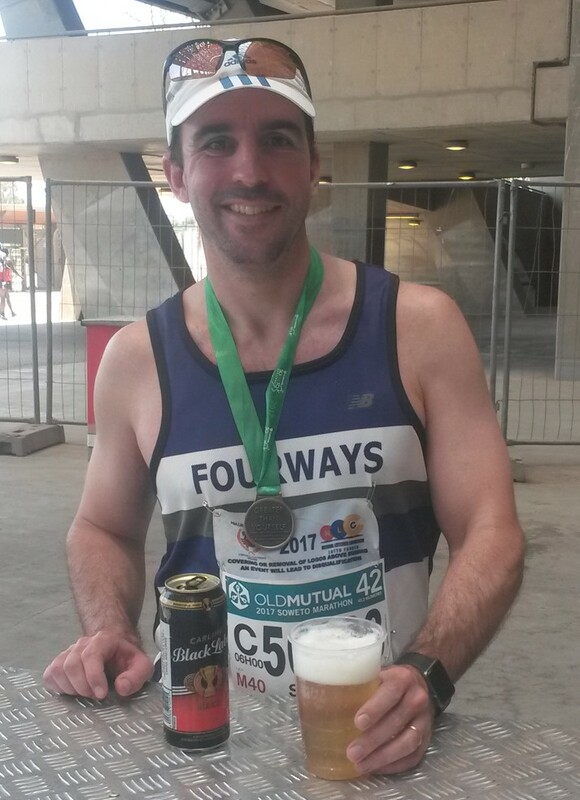 It was a good start for Team Massmart – in their first weekend of competitive running, Mapa Makhanya finished second in Soweto and they got a full house on the Kaapsehoop Marathon podium on Saturday. You meet some cool people running marathons. 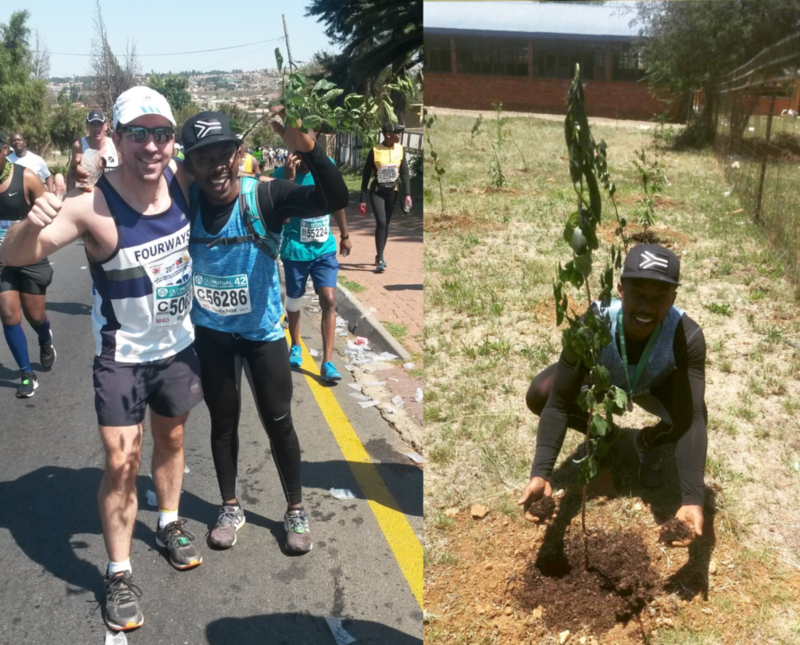 This guy @Siya_Reliance aka #TownshipFarmer runs marathons with a sapling in his rucksack – and plants it at the end of the race! Morris Isaacson High was the grateful recipient of his Soweto sapling. Although not the prettiest of routes, what Soweto lacks in natural beauty is more than compensated with personality – and this is further complemented with plenty of historical interest and cultural appeal. I was fortunate enough to get chatting to an Orlando local one year who pointed out various points of interest and regaled interesting stories from his youth – a bit like having your own personal marathon tour guide. Check out this column from @HowardFeldman which perfectly captures the spirit of Soweto. Vilakzai Street is always a highlight on the route. Named after Benedict Wallet Vilakazi (first black South African to receive a Ph.D.) and the only street in the world to house two Nobel Laureates. In previous years Soweto gained a dubious reputation for various race-day issues and chaotic organisation. 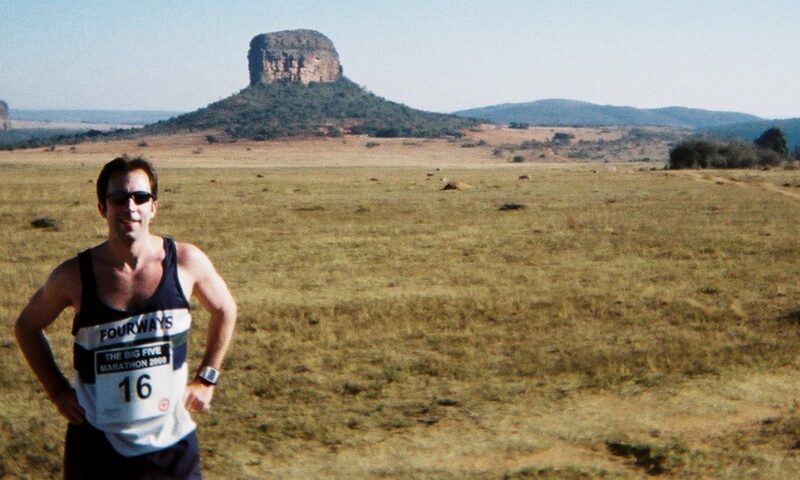 A memory from one of my early Soweto Marathons (when I was still fast and fit – cruising around in sub-3:30 pace) was when most of the tables ran out of water. Thankfully the residents were fantastic and came out with hose pipes, buckets and cups to make sure dehydrated runners did not collapse on their doorstep (if we were running in the ‘burbs it would have been a different story). The low point for Soweto Marathon was in 2013 when the race lost their sponsor had to be cancelled (largely due to squabbling by various administrators). I am pleased to report that the race has really turned things around since then and is now really slick and professional. Securing Old Mutual as the race’s title sponsors has also been great (kudos to Old Mutual who have been a major, consistent long-term supporter of South African distance running). 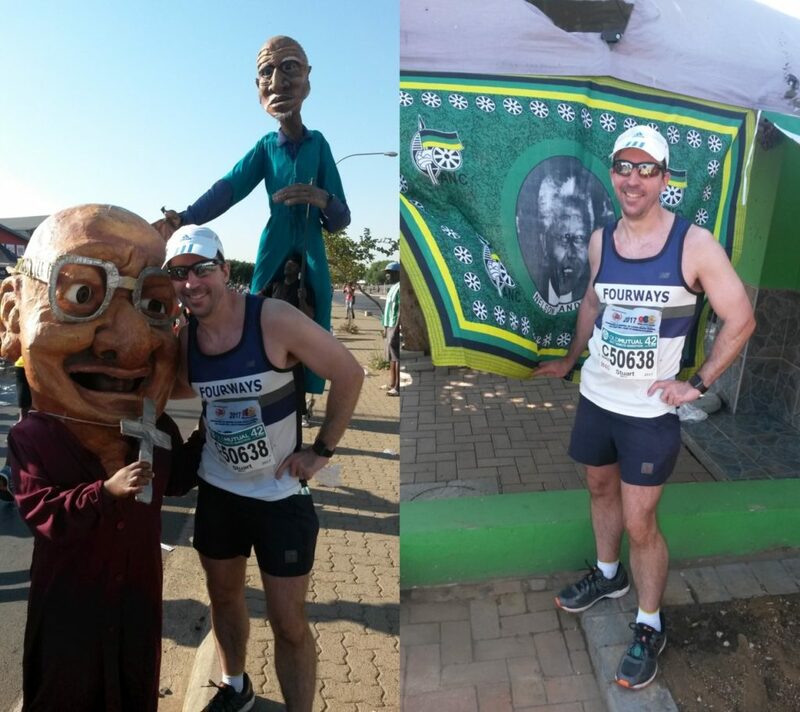 I managed to get photos with both of Vilakazi Street’s Nobel Prize winners, Desmond Tutu and Madiba, during the race. Race shirt: I think they know about this one based on the numerous complaints runners have put onto social media. A nice race pack was ruined by an awful shirt. Aside from a boring design, the cut is so bad it is unwearable. Those responsible for the shirt should be forced to wear it every day for a year. (I am happy to donate mine to this cause and I’m sure that there are 17,000 other runners who would happily do the same). Some water tables: By and large, water tables were great but they don’t quite hit the Two Oceans/Comrades standards. Some of the early tables (where there is a lot of congestion) could do with being longer and on both sides of the road so runners don’t have to scrum down to get their Coke and water. Purple Numbers: I’m not sure what happened to the Purple Numbers for 10 marathon finishes – but as an 11-time finisher I would love to receive a Purple Number to add to my permanent number collection! This was the second year that runners got to finish inside the Calabash. For those of who aren’t professional football players and have an aversion to spending a night in jail after mounting a pitch invasion, Soweto Marathon is the “easy option” to experience what it’s like to be on this famous field. The Calabash is a welcome site to the weary runner – just 1km to go from here! However, the one challenge when finishing in a large stadium for someone like me with no sense of direction is that I am totally clueless as to which exit is closest to my car – and picking the wrong exit could result in your marathon quickly turning into an ultra. Faced with this dilemma, I made what I considered to be the logical decision and headed straight for the exit that was also signposted “Beer Garden”. This proved to be a good choice as it was fairly close to my car and I could enjoy an ice-cold, rehydrating beer as I hobbled along. 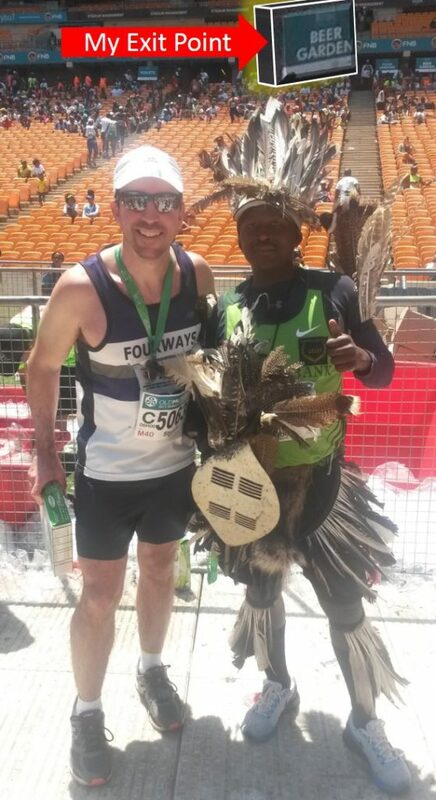 This guy runs all his races in this homemade outfit made from feathers he finds while running. Soweto is a marathon that offers something different to other big races, local or international. I would strongly recommend all South African runners take an “on foot” tour of Soweto at least once during their running careers. International runners, if you’re not scared of heat, hills and altitude Soweto provides a unique cultural and historical race experience that you won’t get anywhere else. 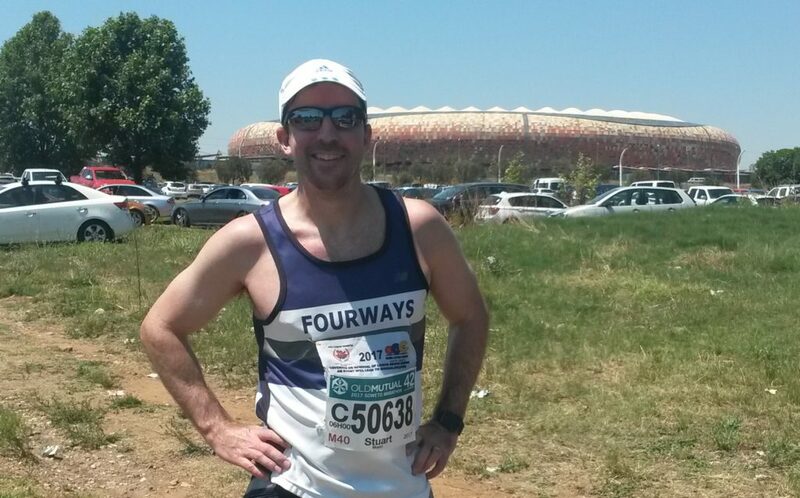 Will I be back to run a 12th Soweto next year?… Probably. If they bring back Purple Numbers… Definitely! The “Beer Garden” exit was a good choice. Rehydrating with an ice-cold beer before heading home. If I could add a gripe though; the organisers ask us to run clean, but I did not see a single bin to throw rubbish in. About 95% of the runners felt free to throw down their sachets where ever and whenever they liked. 😔 That said, it was sad to see just how much litter ‘adorned’ Soweto before the runners added their bit. Thanks – and thanks for the company in the first half of the race! Agree with you on the Run Green drive – it worked pretty well in Cape Town Marathon but I also think more bins were needed. This is awesome writing Stu! Thanks Q. Yes, I sent a link to the organisers and they shared the story is on their Facebook page.